Even without the addition of yoghurt at the end, this soup has something of a silky korma texture, thanks to the creaminess of the parsnips. Just the kind of winter warmer you need in these dark, short days of the year. The town where I live, Frome in Somerset, is lucky enough to have a Food Assembly, which is like a farmers market but you order online in advance. They’re a fantastic event for both consumers like me and producers, so take a look at their website and see if there’s one near you. New ones are opening up all the time. For this soup, I used leeks and parsnips from Vallis Veg who sell at Frome’s Food Assembly. The yoghurt is a deliciously creamy ewe’s milk one from Wootton Organic Dairy, also at the Food Assembly. My chickpea crouton recipe was inspired by the chat salad recipe in Meera Sodha‘s wonderful curry book, Made in India. Try and use parsnips that are as fresh as possible; I’ve made parsnip soup before with older ones and the soup has turned out bitter. Heat the oil and butter in a large saucepan and then fry the onion on a medium heat for 5 minutes, before adding the leek and cooking for a further 5 minutes. Add the chilli, if using, plus the garlic, ginger and spices and cook for a few minutes. Stir in the parsnips and then add the stock. Bring to the boil and then turn down, simmering for 20 minutes or until the parsnips are soft. While the soup is cooking, make the croutons. Rinse and pat dry the chickpeas with some kitchen roll. Heat half the oil on a high heat in a frying pan and when hot but not smoking, add half the chickpeas. After 2-3 minutes, when they should be starting to crisp up (but not burning! ), add half the garam masala and cayenne pepper/chilli flakes, if using. Cook for another 1-2 minutes, then throw in half the mustard seeds. When they start to pop, remove from the heat and then repeat with the remaining ingredients. To assemble, add a swirl of yoghurt to each bowl of soup, topped with chickpea croutons and a scattering of coriander leaves. 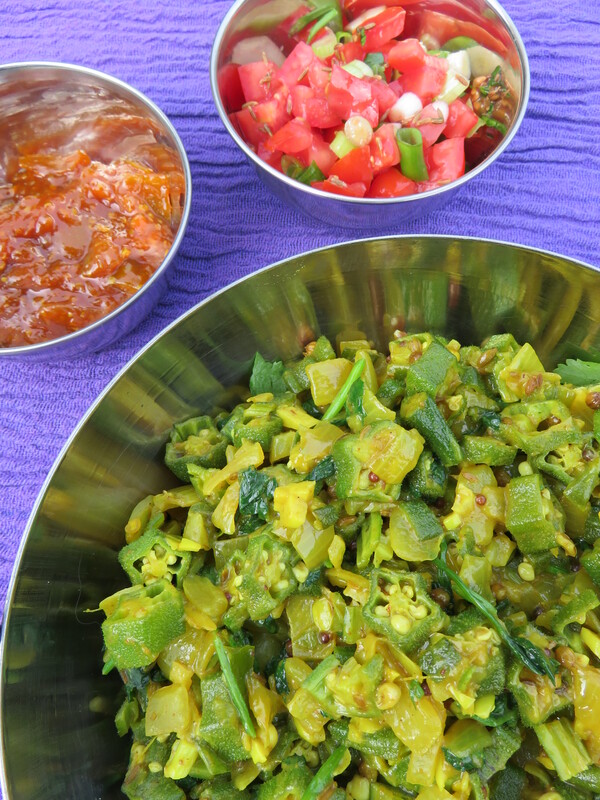 Serve with naan or chapatis. I’m keeping on a Portuguese theme this week, perhaps in an attempt to recapture holiday memories in these early days of autumn. For me, Portugal is synonymous with sardines, an economical and delicious fish, and best served as fresh and as simply as possible. 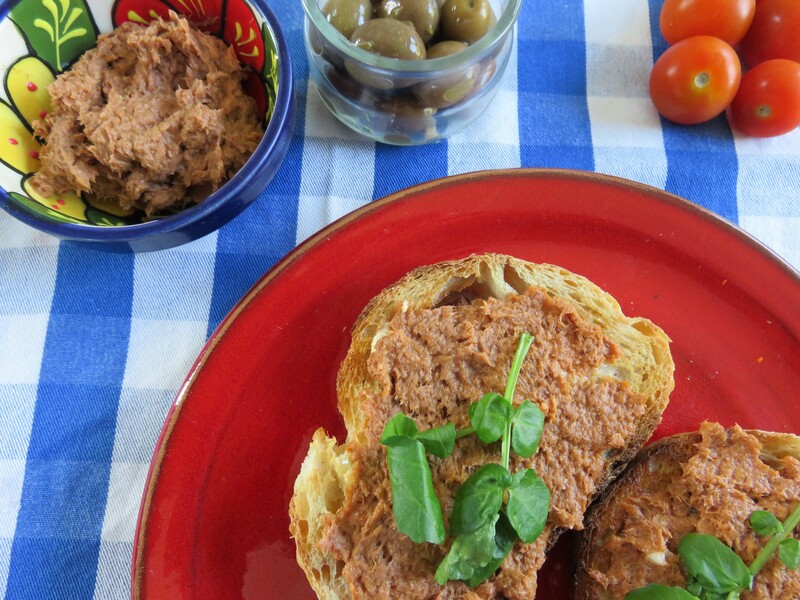 Although this Portuguese sardine pate recipe uses tinned sardines, it’s simplicity itself. 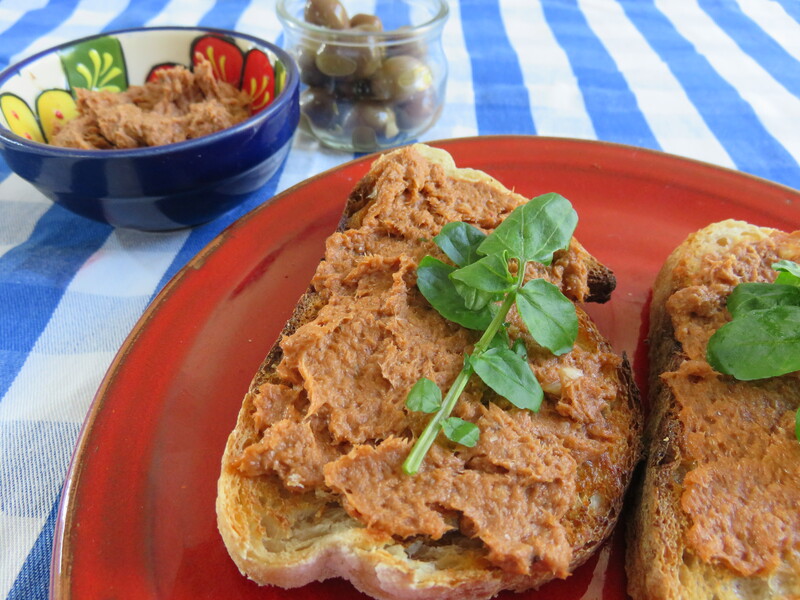 Paté de sardinha is ubiquitous in restaurants, arriving before a starter, alongside sourdough and salty grey-green olives. We always bulk buy it to bring home but it never lasts more a month in our house because it’s so popular, so making our own makes perfect sense. This recipe is cheap, quick and easy, and is loaded with lots of healthy omega 3 fatty acids, as well as being high in calcium (if you buy the tinned sardine variety with bones left in) and protein. It’s good for breakfast, spread on toast which has first been rubbed with a clove of garlic and drizzled with olive oil, or for a picnic dip with crackers. Or try it in sandwiches for a speedy lunch. Simply put all the ingredients in a jug and blend with a stick blender, or blend in a food processor. 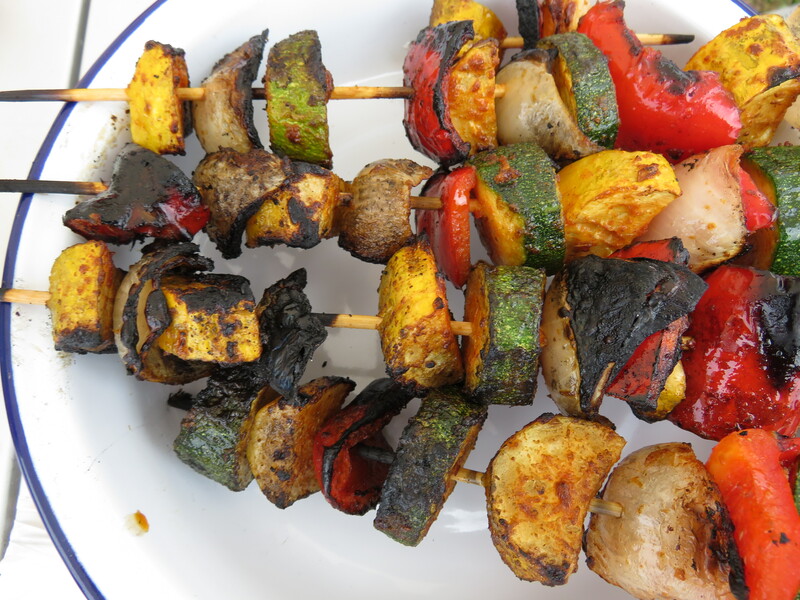 Made with my favourite marinade, these vegetable kebabs are quick, easy and perfect for barbecues and campfire cooking. You can add or swap the veg for any others you have handy, like aubergine or mushrooms. I’ve also used the same marinade for fish (I’ve tried it on mackerel and bream, but others would work too) and chicken (for this, I replaced the dried oregano with fresh rosemary). If you haven’t got a barbecue or a fire on the go, you can also cook these under the grill. 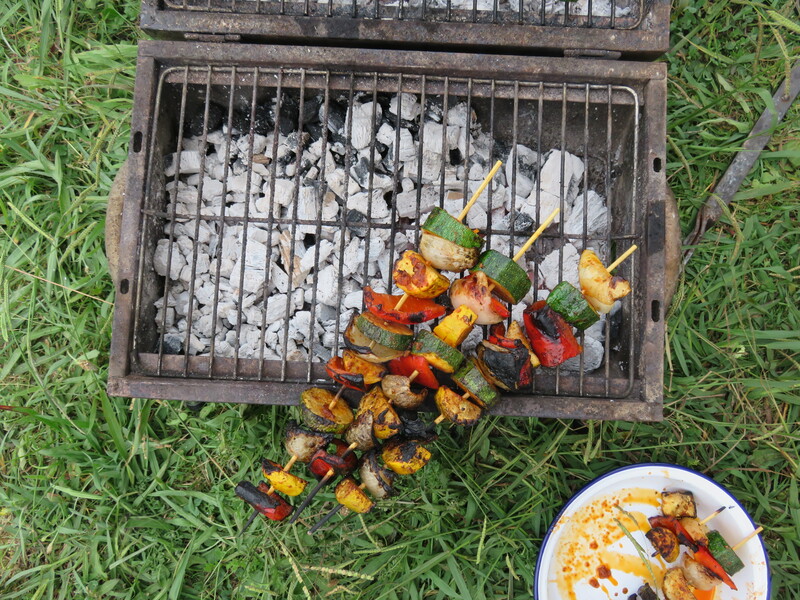 When camping, I always take some store cupboard herbs and spices and these include dried oregano, cumin and smoked paprika, making kebabs like these easy to throw together. Mix the marinade ingredients thoroughly. If you have a jar with a lid, then you can shake it up in this, otherwise just mix it in a mug with a fork. 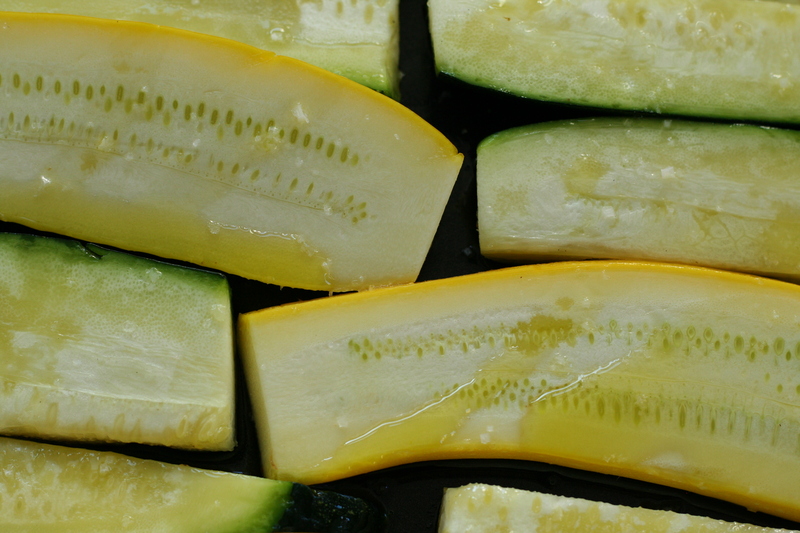 Cut the courgette into thick slices and the pepper into fat squares. For the onion, halve it lengthways then cut in half widthways, so you end up with large rough squares. In a large bowl, tip the vegetables in and mix thoroughly with the marinade. Leave to infuse while you light the barbecue or heat the grill. Thread the vegetables onto the skewers. Cook until the vegetables are just tender and slightly charred. Pour over any leftover marinade before serving. My vegetable beds are looking deliciously green at the moment, helped along in their lushness by this abundant rain, interspersed with bright sunshine. 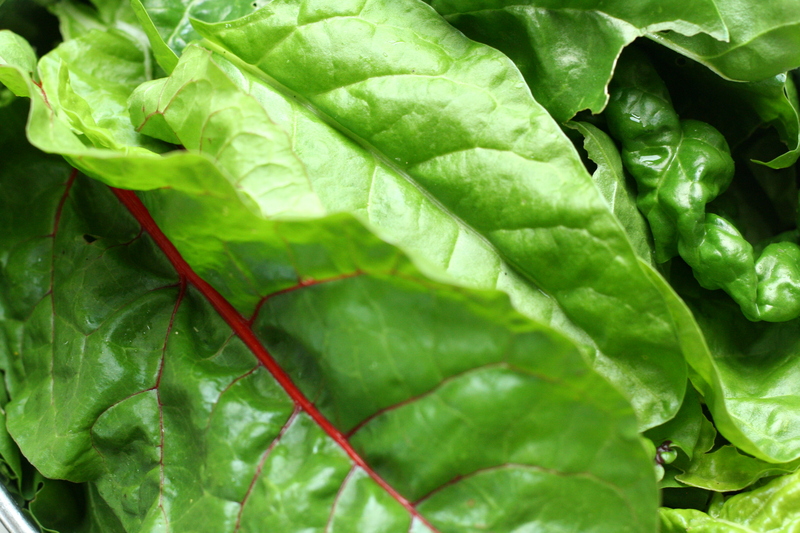 I have the most spinach and swiss chard I’ve ever succeeded in growing and this recipe is a incredibly easy and tasty way of using several large bowlfuls of it. I’ve adapted it from a traditional pita recipe created by Nina from Bosnia and Herzegovina at Nina’s Kitchen. We’re avoiding cow’s milk at the moment, so I made this with goat’s yoghurt and ewe’s milk feta, but you can experiment with any combination of yoghurt and cheese, including cottage cheese. This pie was so popular in our house that we didn’t have any leftovers but if you’re lucky enough to have some remaining the next day then it’s great cold too, in lunchboxes or for a picnic. Preheat the oven to 200ºC (180ºC fan, gas mark 6). 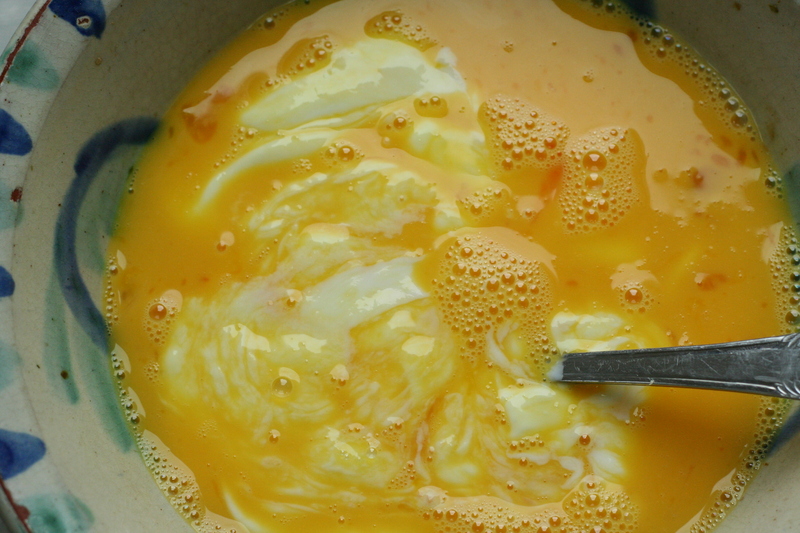 Beat the eggs and mix with the yoghurt and salt. Brush the bottom of an oven dish (I used one 40 cm by 20 cm) with the oil. 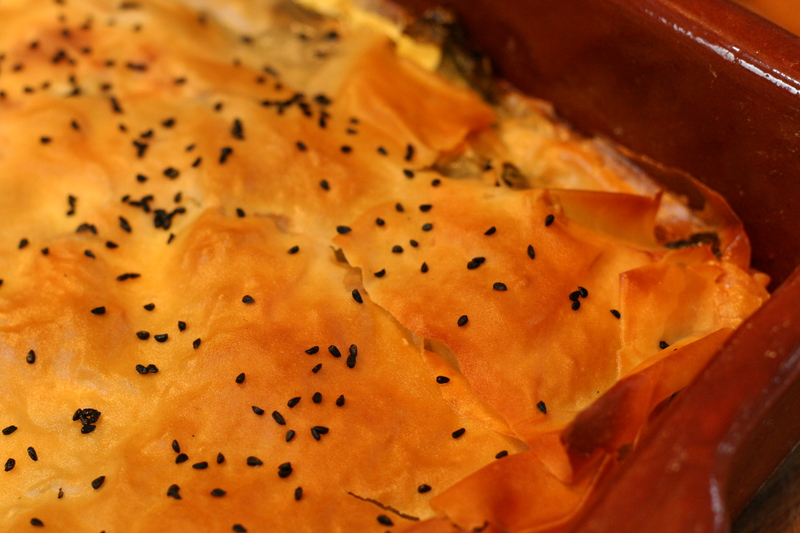 Place 1 sheet of filo on the bottom of the dish and brush with oil, before adding another and brushing with oil. 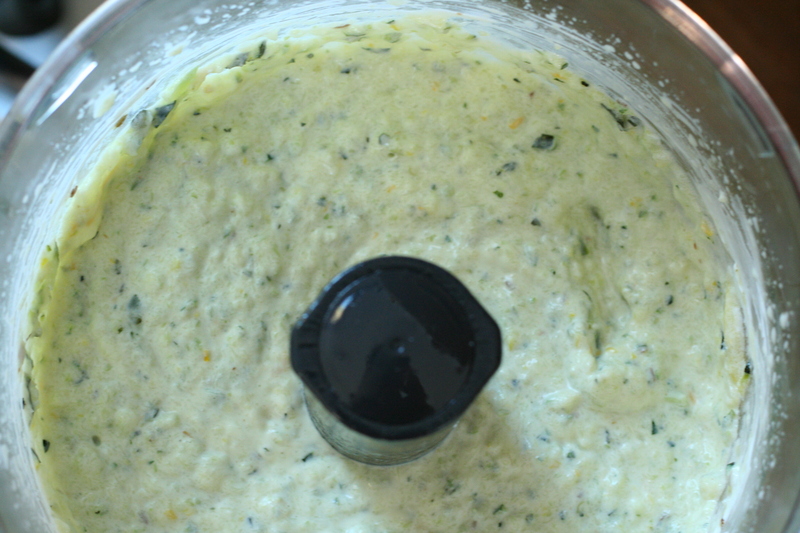 Then spread out half the spinach, dot with half the feta cheese and spoon over half the yoghurt and egg mix. 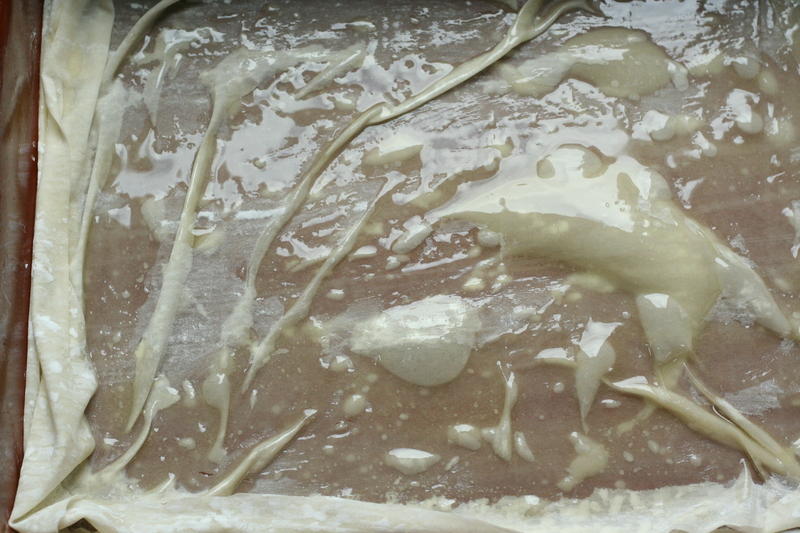 Add another layer of filo, brush with oil, then add another, also brushing with oil. 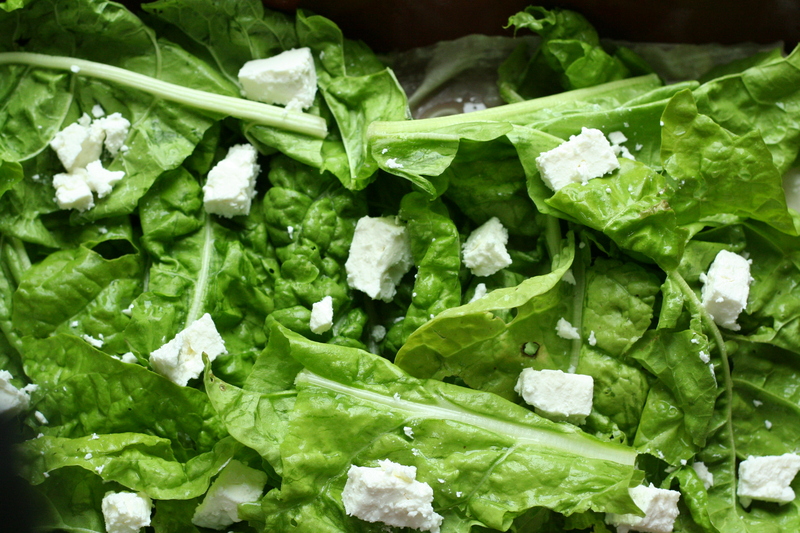 Repeat the spinach, feta and yoghurt mix layer. 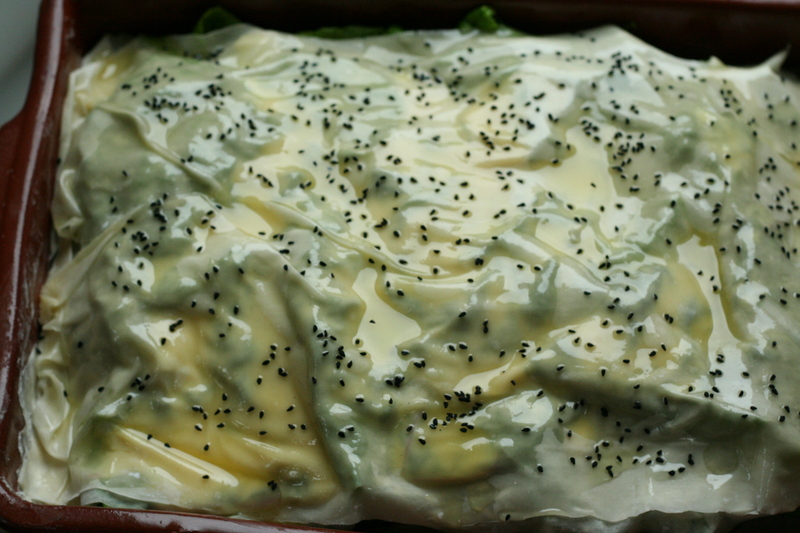 Place another 2 layers of filo, each brushed with oil, then sprinkle with the seeds. Bake for 40 minutes until golden on top. Inspired the original and utterly wonderful cockled popcorn on a recent visit to No 1 Cromer, I decided to try recreating it at home with successful results! I can’t justify stealing No 1 Cromer’s fabulous name, though, so renamed it the rather more prosaic cockle tempura. If you’re ever in Cromer, visit No 1 Cromer; they make brilliant seafood dishes. I also had a particularly tasty crab salad. I adapted a tempura recipe from http://glutenfreerecipebox.com/gluten-free-tempura. As the Gluten-free Recipe Box explains, the secret to good tempura is cold ingredients, hence the rather unusual start to the beginning of this recipe. Of course, you can simply plan ahead (which I didn’t) and put the flour and water in the fridge for an hour or so instead. Mix the flours, salt and bicarbonate of soda together, and place in the freezer for 10 minutes, along the water. When they’re cold, whisk them together. Heat 2 inches of oil in a saucepan to 190°C. Add the cockles in batches to the batter, because it’s best not to crowd to the pan when you come to cook them (I divided them into three batches). Mix well, then use a metal slotted spoon to remove them, placing them in a separate bowl (I found this helped me with the next stage). Drop the battered cockles carefully in the hot oil using the metal slotted spoon, trying to separate them as they go in, otherwise they will clump together. Fry for 30-60 seconds, then remove them using the slotted spoon and place them on a plate covered with a paper towel. A change in the weather and the beginnings of an autumnal cold has made me crave warming, nourishing curries this week. I also like to cook a big pot of soup or curry to have for lunch during the week. 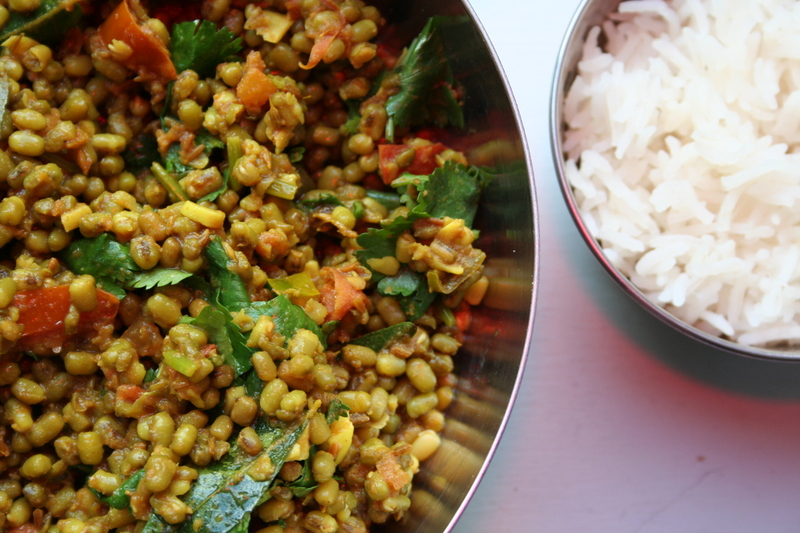 This easy mung bean curry recipe is also cheap and very satisfying, either served simply with plain boiled basmati or as part of a thali spread, with lime pickle and yoghurt. I would like to serve this with chapati too, but since going gluten-free have yet to find a decent recipe. I tried a 100% gram flour one to go with this curry, but the dough was too hard to work with. So please let me know if you’ve got any easy gluten-free chapati recipes! I made this curry quite dry, but if you’re in a soupy mood, then feel free to add more of the reserved stock to make it more liquid. Put the mung beans in boiling water in a saucepan and simmer for 10 minutes, or until just soft. Drain, and reserve the cooking liquid. Heat the sunflower oil in a saucepan. Fry the garlic, chillis and spices on a medium-low heat, without letting the garlic colour, for five minutes. Turn the heat up to medium and add the tomatoes and salt, cooking for 10 minutes until the tomatoes are soft. Add the coriander stalks, curry leaves and mung beans, putting in about a wine glass of the drained mung bean cooking water, or as much as required. Simmer the curry for 5-10 minutes. Stir in the chopped fresh coriander leaves. I fully got into the curry vibe during a weekend visit to Easton, Bristol, this weekend, with an evening at the wonderful Thali Café and a shop at the Sweet Mart. I stocked up on okra, because as I live in the wilds of Somerset, even in a town like Frome, this vegetable is something of an exotic novelty for me these days. I love their impossibly funky bike wheel pattern when they’re sliced open, and their weird and unique ooziness. 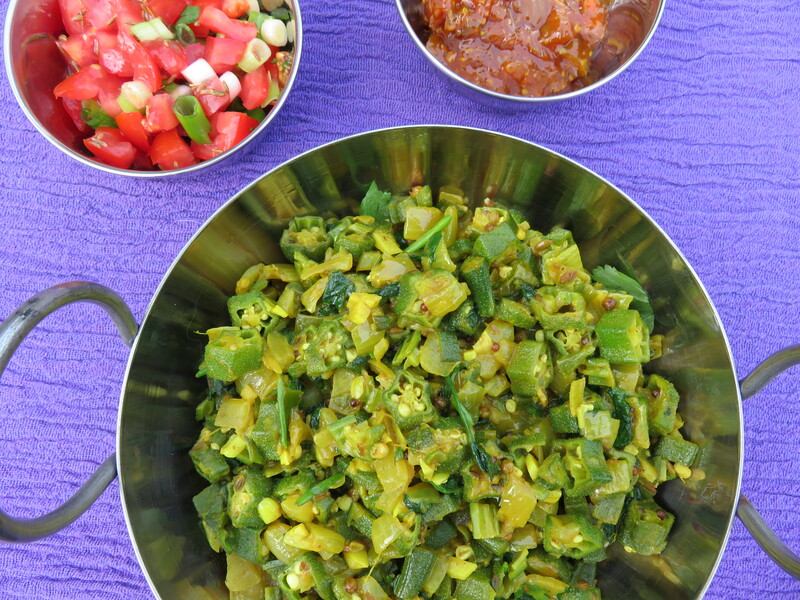 This recipe is adapted from one I learnt at Little Cove Yoga Retreat in Goa. Don’t be deterred by the long list of ingredients; like many curry recipes, there’s really not that much to it once you get started, as most items listed below are spices you can just throw in. Heat the oil on a medium-high heat and cook the mustard, coriander and fennel seeds for a few minutes, until the mustard seeds start to pop. Turn the heat down to medium low and add the onions, ginger and chillies, cooking for 10 minutes. 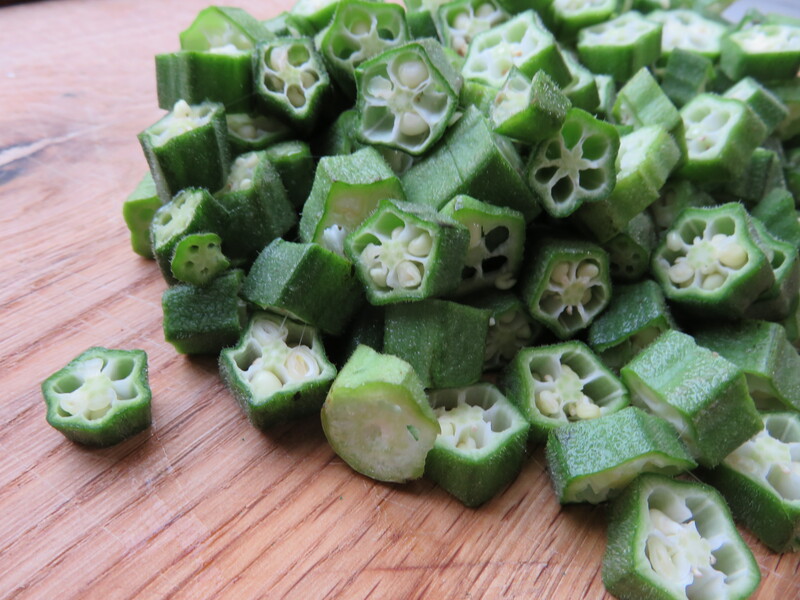 While the onion is cooking, slice the okra into pieces about 0.5cm thick. After the onion has cooked for 10 minutes, add the garlic, turmeric, cumin seeds, garam masala and salt. Cook for a further 10 minutes. Add the okra and 50ml of water and cook, covered, on a low heat for 20 minutes. Add the coriander and cook for another 5 minutes. 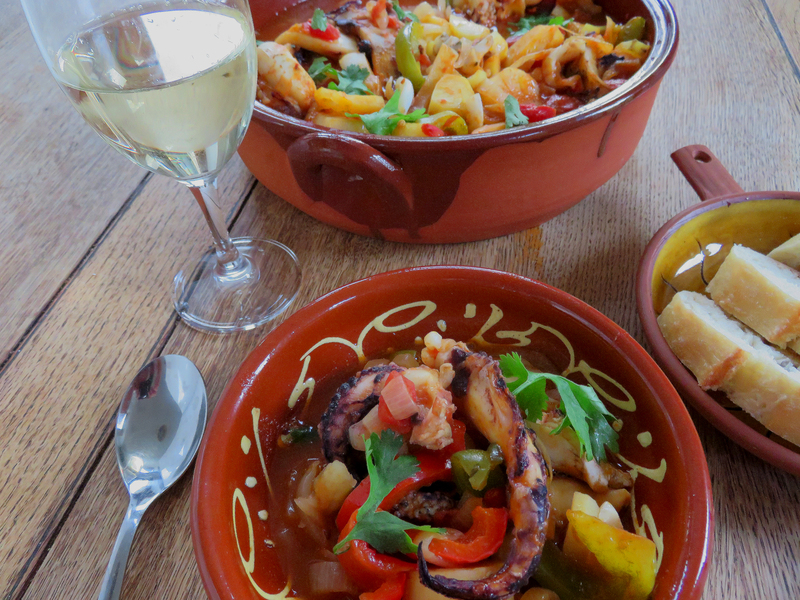 I love Portuguese food, particularly seafood. My favourite dish is sardinhas assadas, preferably served at a rustic seaside bar with a cold Sagres or a glass of Vinho Verde. I also love the various tiny artisan cheeses, fish pate, chewy sourdough and gorgeous salty olives that come before your starter in restaurants; watch this space for a Portuguese sardine pate recipe. This summer I had some fantastic squid in both Spain and Portugal, including the relatively unusual albondigas de choco, another recipe that will be featured here sometime soon. But for the time being, I’ve made a caldeirada de lulas, which I took to my monthly food club this weekend, with Portugal as its theme for September. The key to the delicious rich sauce is to cook the onions until they start to caramelise and to be generous with the wine. 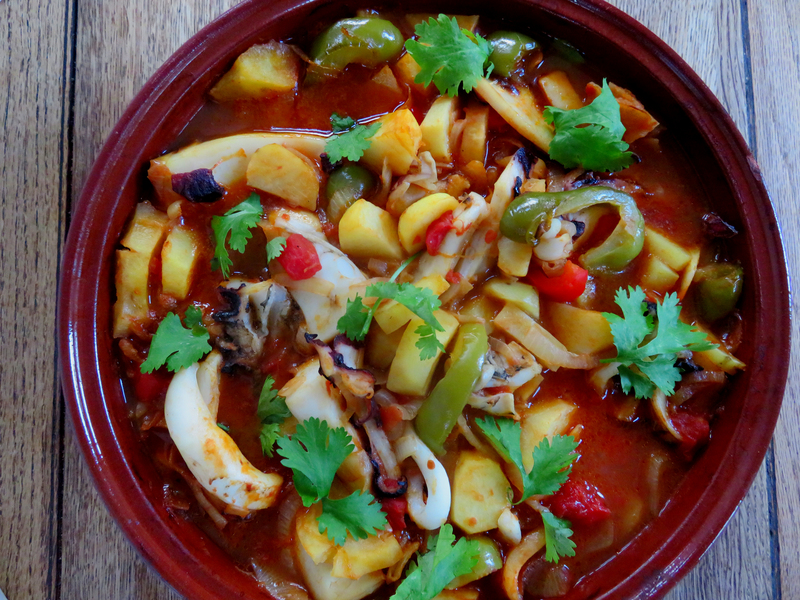 I try to get hold of cuttlefish for this recipe as it’s so much cheaper than squid. Preheat the oven to 170ºC fan/325ºC/as mark 3. Cut the squid or cuttlefish into thick slices of 2 cm by 5 cm. Heat the oil in a large roomy pan. Add the onions and cook for 10 minutes on a medium-low heat. Stir in the peppers, leaving to cook for another 10 minutes, before adding the garlic, and cooking for a further 5 minutes. Add the wine, tomatoes, bay leaf and potatoes, and bring to the boil. Stir the squid in the stew. Once it’s simmering, season to taste and then transfer the stew to a casserole dish and place, covered, in the oven for an hour. Season, then sprinkle with coriander. Due to a few weeks of neglect and super fertile soil, my courgette plants are now giant triffids and my courgettes in danger of turning into marrows. Today I decided enough was enough and started on what will be an epic week of dealing with a courgette glut, starting with a lovely dip, which is a good side dish for barbecued lamb or chicken or with my pitta triangles in a picnic. If you don’t have a good, thick Greek yoghurt, strain whichever yoghurt you have for a few hours before adding it to the courgette mix so it doesn’t go too runny. 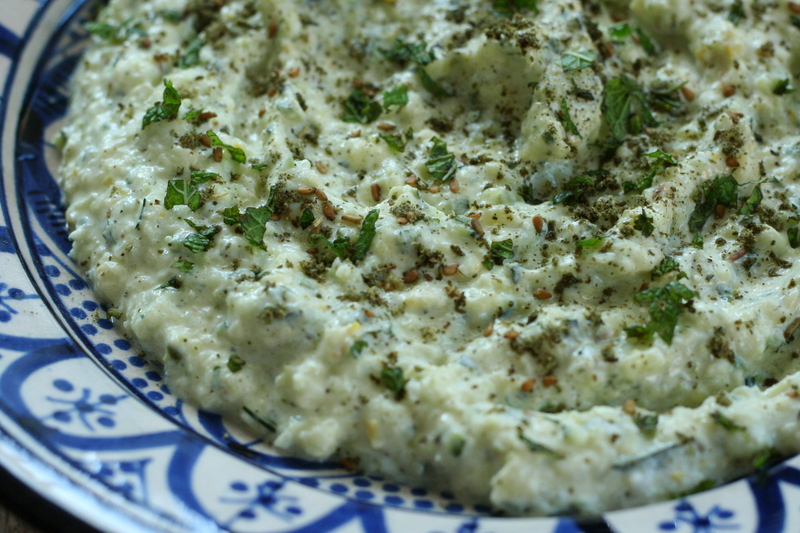 I like my dips garlicky so have added three cloves of garlic but two is probably enough for many people. 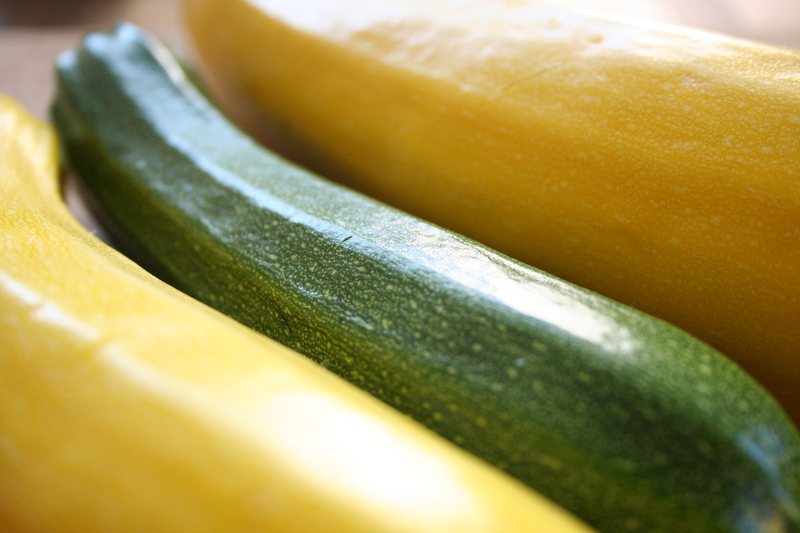 Slice the courgettes lengthways in fat slices and place on a baking tray in a single layer. Drizzle with olive oil and sprinkle with salt and cumin seeds. Roast for 20 minutes until just cooked. 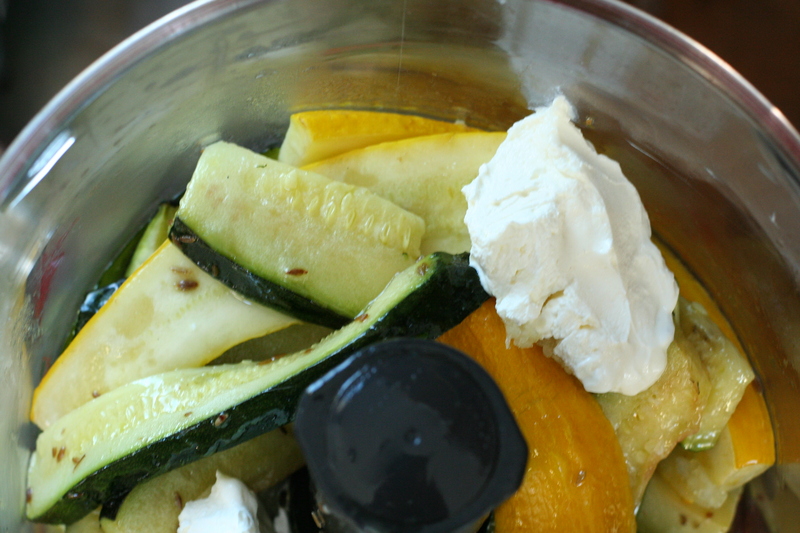 Place the roasted courgettes in a food processor with the yoghurt, lemon juice and garlic. Pulse briefly so the mixture still has a bit of texture. Stir in the fresh herbs, reserving a few chopped mint leaves, and cheese. Season to taste. 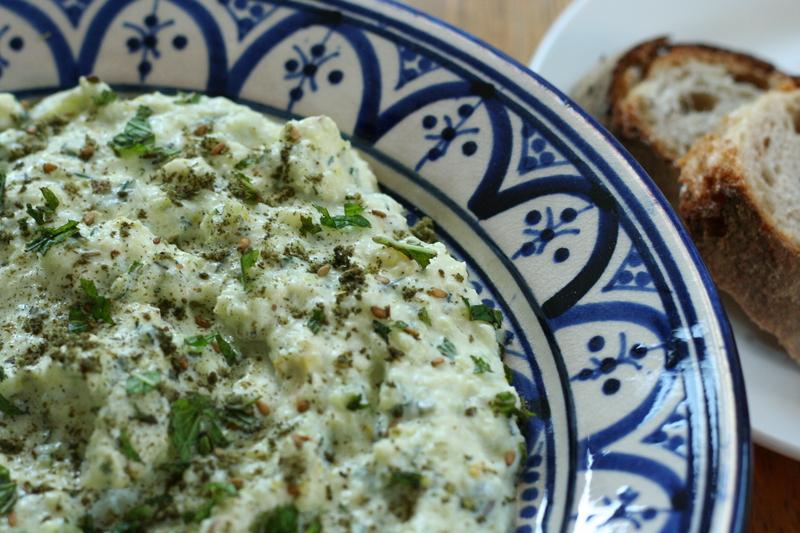 Place in a serving dish and sprinkle with za’atar and the reserved mint leaves. Serve with pitta triangles, sourdough or a mixture of raw vegetables, such as carrots, peppers and radishes. We are busy preparing for our annual pop-up tapas bar at the Silk Mill in Frome. Unfortunately, I can’t do all the cooking this year due to recent back sugery – which has also meant less blogging in recent weeks, although I’m now on the mend – but I can still experiment with new dishes for our menu. I thought I’d try making a pisto because after our tapas bar last year people suggested we add more vegetarian dishes. We were trying to be authentically Spanish as possible in our bar – Spain is a particularly keen meat-eating nation – so subconsciously probably didn’t offer a huge range of vegetarian dishes. 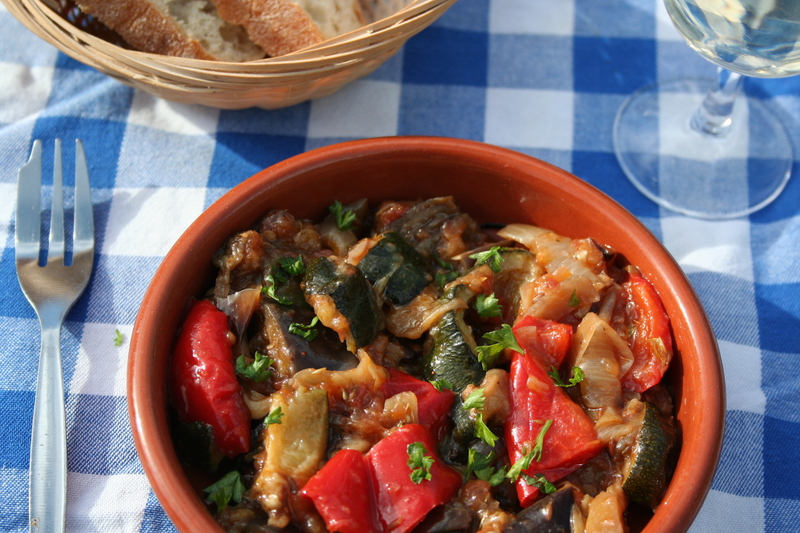 Pisto is a summer classic and a Spanish version of ratatouille. 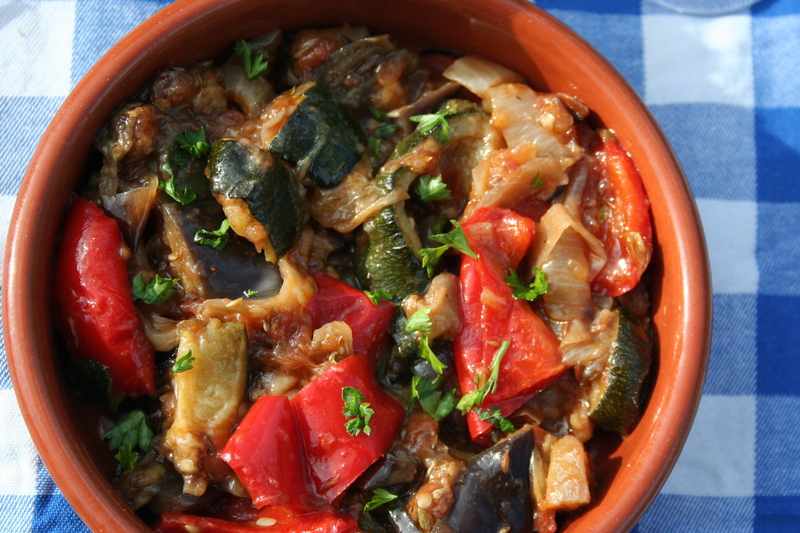 It’s a great recipe to use up a glut of aubergines, courgettes and peppers. Roasting most of the veg in the oven as I’ve done here makes it far easier than frying all the individual vegetables separately. It also uses less oil, making it cheaper and healthier too. I’ve added cumin seeds to this for a Moorish flavour, along with the more conventional dried oregano. Pisto is good served at room temperature as part of a tapas spread, or hot with an fried egg on top for brunch. Either way, make sure you have some robust sourdough with which to mop up those lovely oily juices. It’s also great with the deliciously salty mojama, dried tuna which is made in Cádiz province, or a few slices of Manchego, washed down with a chilled manzanilla (my current favourite is La Gitana). Heat the oven to 200°C fan (220°C, gas mark 7). Place the oil (reserving 1 tsp), aubergines, courgettes, peppers, onions and garlic in a few large trays, making sure the vegetables are in a single layer otherwise they’ll just go soggy. Sprinkle with the cumin, oregano and salt and mix well. Put in the oven for 20 minutes, stirring once, until just starting to caramelise. Meanwhile, heat the remaining 1 tsp of oil in a saucepan on a medium-high heat and add the grated tomatoes. Simmer for 10-15 minutes until broken down into a sauce. Mix the roasted veg with the tomatoes and adjust the seasoning. Leave to cool and serve at room temperature. 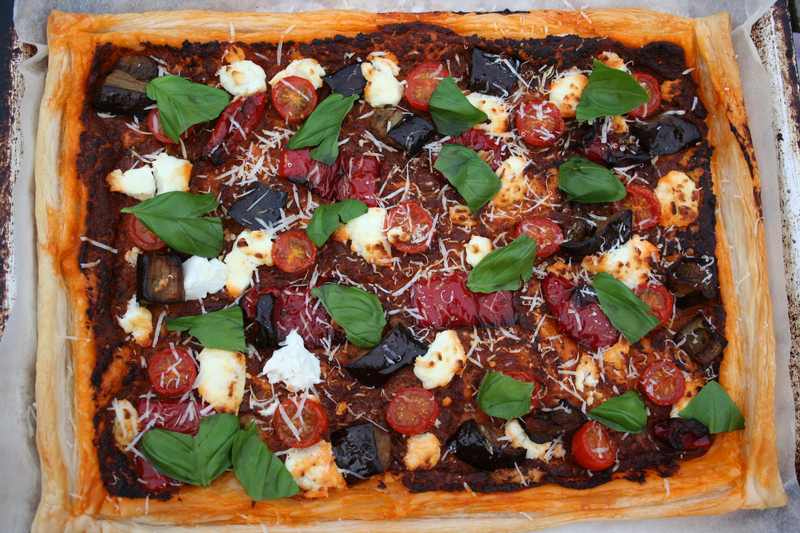 If you double the recipe, you can use half the roasted veg for a pisto and goat’s cheese tart. Use a sheet of ready rolled puff pastry, spreading sundried tomato pesto on top, followed by the pisto. Dot with some goat’s cheese (I used about 100g of cheese here) and some halved cherry tomatoes. Bake it for about 25 minutes in an oven preheated to 180°C fan (200°C, gas mark 6) and sprinkle some basil on after you take it out. 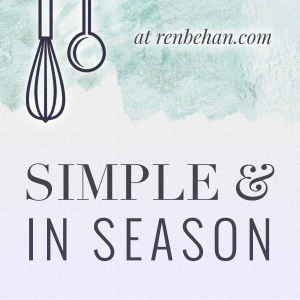 As this dish is made with seasonal veg, I’m entering it for the Simple and in Season June Challenge, hosted by Ren Behan. Because this pisto recipe is packed with veg, I’m also entering it for June’s Extra Veg hosted by Helen at Fuss Free Flavours and Michelle at Utterly Scrummy. Spot the seven-year-old on Cromer Pier. Crack open the oloroso! I'm now a fully fledged sherry aficionada after a tasting at La Gitana bodega in Sanlucar de Barrameda. In the land of manzanilla bodegas and seafood tapas galore, Sanlucar de Barrameda. The start of this summer's culinary tour of Spain! 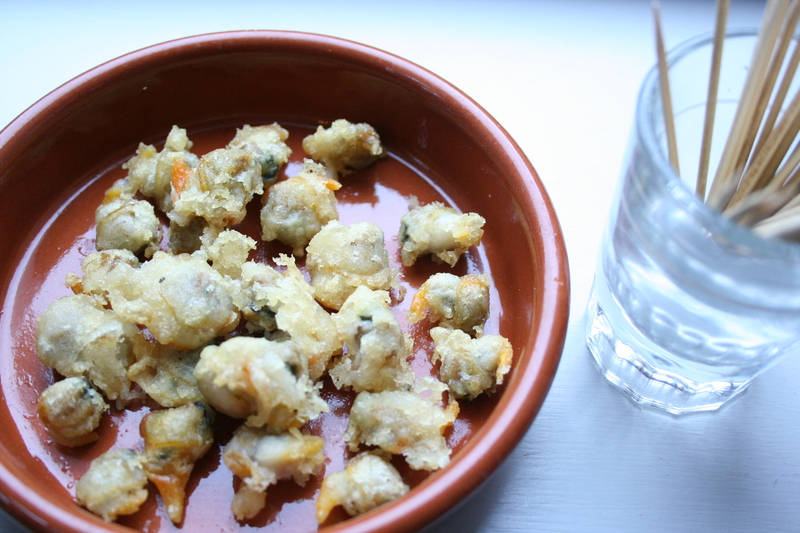 Goosefoot barnacles accompanied by Asturian cider poured from a height in Llanes.